The launch ceremony for the second phase of the Weichai Lanqing WP12 and WP10 assembly line was held at Weichai Power Plant No.2. The Lanqing WP12 Phase II production line has a total of 103 stations, of which 15 are automatic stations, 15 are semi-automatic stations, and the rest are manual stations. The design and production cycle time is 3 minutes and the annual production capacity is 100,000 units. This line draws on the advantages of Lanqing Phase I production line, extensively uses information technology tools, has a high degree of automation, online testing equipment, and strong quality assurance capabilities. The WP10 assembly line adopts a combination of motorized raceway and ground tow chain. The total number of stations is 48 stations. It features fast response, convenient and flexible production organization. The main bolts of the engine on the assembly line are completed by tightening the shaft, and the rest of the bolts are tightened with pneumatic tools controlled by constant torque to ensure the assembly quality of engine components. The design and installation of the Lanqing WP12 Phase 2 project and the WP10 assembly line not only captured the length of the Lanqing Phase I and 615 assembly lines, but also paid more attention to the features of simple, practical, lean and fast production. The official commissioning of the two production lines indicates that the No. 2 plant already has an annual production capacity of 200,000 engines, and that the No. 2 plant has become the only producer of Weichai No. 3, No. 4, No. 5 and No. 4 valves WP12. The production base of the engine has added to the company the production capacity of 200 WP10s per day. The machine is used to process untwisted chinlon into high stretch fiber.At the same time, it can make spandex and stretch chinlon to be air covering. Through the special intermingle nozzle to achieve chinlon/polyester air covering in one step. The machine is the most advanced, low energy consumption,but high production. 1.Three rollers named machine D1,D2,D2.2,all adopt the godet mechanism. The godet is controlled by the micro-motors. It control the fiber will and ensure the stretching. 2.The machine`s two sides (A-B) running relatively independent, both adopt energy-saving motor instead of belt,the process parameters can be set separately. Two sides could process different productions. 3.The specially energy-saving nozzle can save air and power. 4.Two-step D2 roller structure improve the node uniformity and fastness of the nylon spandex. 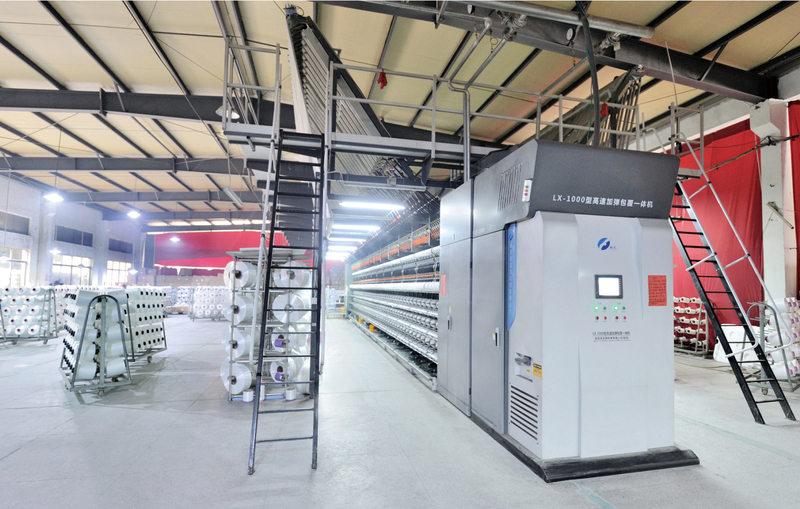 5.The special fiber structure is adopted to improve the efficiency of fiber processing. 6.The adjustable spandex universal support is adopted to ensure the spandex feeding well during high speed running. 8.Machine`s deformation heater adopts biphenyl air heating.The temperature precision is exact to Â±1 â„ƒ assure every spindle`s temperature to be same.This is beneficial for dying. 9.Excellent machine structure reliable drive system and low noise. It is easy for process adjustment, and maintained by single spindle to improve productivity.